Learning through discovery is always better than being told something – unless it involves something that causes pain. I learned about electricity when I was 4 years old by sticking a key into an electrical outlet. I had been told not to, but the lesson didn’t sink in until I tried it on my own. Fortunately, the activity below is much more pleasant. My Algebra II class has been using Desmos as its go to graphing calculator all semester. 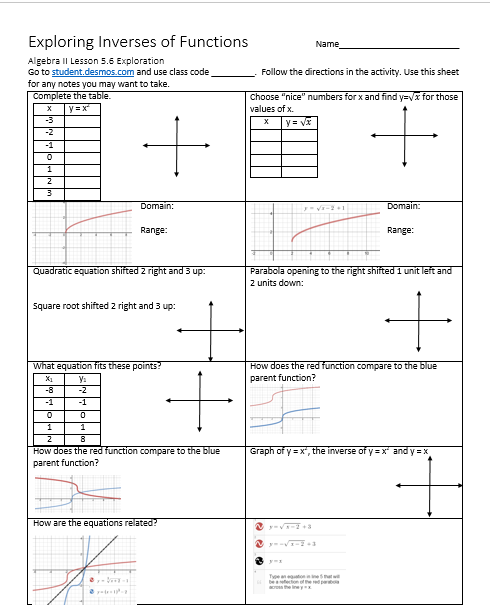 I decided to try Desmos’ Activity Builder and created a companion worksheet so my students could jot some notes and we could use it for discussion points and follow up. The companion worksheet is below. Happy Exploring! Thanks for posting your activity & worksheet, Stacie. I’m curious how the paper worksheet and the digital activity work together. What does one offer you that the other doesn’t? Could this entire activity live in one medium or the other? What would be lost? My co-teacher and I have used guided discovery with Desmos as our primary tool on numerous occasions so far this school year in our Algebra II class. With this particular group of students, as a whole, they tend to “get it” when they have a worksheet like http://systry.com/wp-content/uploads/2015/10/Polynomial-Functions-Exploration.pdf or http://systry.com/wp-content/uploads/2015/11/Graphing-Radical-Functions-Exploration.pdf or in front of them as they graph various functions in Desmos and make their discoveries. When we used the Polynomial Equations Challenge (https://teacher.desmos.com/activitybuilder/custom/561582ecbd554ea00760f933) with them, they needed more direct instruction both during the activity and later as a follow up. It could simply be that the activity had many more concepts being explored, but we didn’t get the “aha” moments and connections we were looking for. We also have great note takers in this particular class who want to go back and review what they learned off-line. I wish I had surveyed my students at the end of this particular activity to see which they preferred or if the worksheet was even necessary. It was simply a gut feeling we both had with this group of students who have not historically had a lot of success in math.